(Nanowerk News) An international team of astronomers, including researchers from the Max Planck Institute for Radio Astronomy and from the University of Cologne, successfully identified two titanium oxides in the extended atmosphere around a giant star. The object VY Canis Major is one of the largest stars in the known universe and close to the end of its life. The detection was made using telescope arrays in the USA and in France. The discovery was made in the course of a study ("Pure rotational spectra of TiO and TiO2 in VY Canis Majoris") of a spectacular star, VY Canis Majoris or VY CMa for short, which is a variable star located in the constellation Canis Major (Greater Dog). "VY CMa is not an ordinary star, it is one of the largest stars known, and it is close the end of its life," says Tomasz Kaminski from the Max Planck Institute for Radio Astronomy (MPIfR). In fact, with a size of about one to two thousand times that of the Sun, it could extend out to the orbit of Saturn if it were placed in the centre of our Solar System. Gone with the stellar wind: an extended dusty nebula surrounds VY CMa in the constellation Big Dog, one of the largest known stars in the universe. In the atmosphere of this huge sun, astronomers discovered the molecules TiO and TiO2. The star ejects large quantities of material which forms a dusty nebula. It becomes visible because of the small dust particles that form around it which reflect light from the central star. The complexity of this nebula has been puzzling astronomers for decades. It has been formed as a result of stellar wind, but it is not understood well why it is so far from having a spherical shape. Neither is known what physical process blows the wind, i.e. what lifts the material up from the stellar surface and makes it expand. "The fate of VY CMa is to explode as a supernova, but it is not known exactly when it will happen", adds Karl Menten, head of the “Millimetre and Submillimetre Astronomy” Department at MPIfR. Observations at different wavelengths provide different pieces of information which is characteristic for atomic and molecular gas and from which physical properties of an astronomical object can be derived. Each molecule has a characteristic set of lines, something like a ’bar code’, that allows to identify what molecules exist in the nebula. The research team observed TiO and TiO2 for the first time at radio wavelengths. In fact, titanium dioxide has been seen in space unambiguously for the first time. It is known from every-day life as the main component of the commercially most important white pigment (known by painters as “titanium white”) or as an ingredient in sunscreens. It is also quite possible that the reader consumed some amounts of it as it is used to colour food (coded as E171 in the labels). However, stars, especially the coolest of them, are expected to eject large quantities of titanium oxides, which, according to theory, form at relatively high temperatures close to the star. "They tend to cluster together to form dust particles visible in the optical or in the infrared," says Nimesh Patel from the Harvard-Smithsonian Center for Astrophysics. "And the catalytic properties of TiO2 may influence the chemical processes taking place on these dust particles, which are very important for forming larger molecules in space", adds Holger Müller from the University of Cologne. Absorption features of TiO have been known from spectra in the visible region for more than a hundred years. In fact, these features are used in part to classify some types of stars with low surface temperatures (M- and S-type stars). The pulsation of Mira stars, one specific class of variable stars, is thought to be caused by titanium oxide. Mira stars, supergiant variable stars in a late stage of their evolution, are named after their prototype star “Mira” (the wonderful) in the constellation of Cetus (the ‘sea monster’ or the ‘whale’). The observations of TiO and TiO2 show that the two molecules are easily formed around VY CMa at a location that is more or less as predicted by theory. It seems, however, that some portion of those molecules avoid forming dust and are observable as gas phase species. 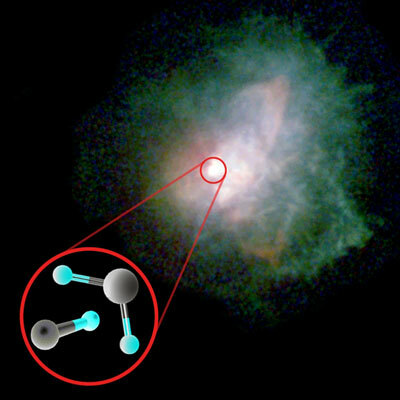 Another possibility is that the dust is destroyed in the nebula and releases fresh TiO molecules back to the gas. The latter scenario is quite likely as parts of the wind in VY CMa seem to collide with each other. The new detections at submillimetre wavelengths are particularly important because they allow studying the process of dust formation. Also, at optical wavelengths, the radiation emitted by the molecules is scattered by dust present in the extended nebula which blurs the picture, while this effect is negligible at radio wavelengths allowing for more precise measurements. The discoveries of TiO and TiO2 in the spectrum of VY CMa have been made with the Submillimetre Array (SMA), a radio interferometer located at Hawaii, USA. Because the instrument combines eight antennas which worked together as one big telescope 226-meters in size, astronomers were able to make observations at unprecedented sensitivity and angular resolution. A confirmation of the new detections was successively made later with the IRAM Plateau de Bure Interferometer (PdBI) located in the French Alps.